High-profile sport and business personalities are behind a 50-hectolitre brewing start-up in Victoria. 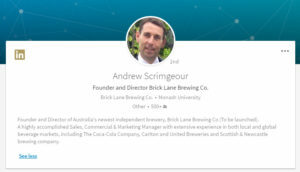 Brick Lane Brewing Co has been founded by director Andrew Scrimgeour, managing director of Melbourne-based pumps and engineering company Renroc, who has a marketing background including stints at Carlton & United Breweries, Adidas and The Coca-Cola Company. Co-founder Paul Bowker, a lawyer, is also on the board. He was most recently director of corporate development and company secretary at ASX-listed resources company LogiCamms, positions he resigned on February 17 this year. According to his Linkedin, Bowker is also a past director and founder of Two Social, “an integrated marketing and brand development agency whose clients included national beverage company Lion”. The third board member is Bart Campbell, the NZ-born co-owner and chairman of NRL club Melbourne Storm who is also founder and executive chairman of London-listed sports marketing and athlete management business, TLA Worldwide. Three companies linked respectively to Campbell, Scrimgeour and Bowker are the biggest shareholders in Brick Lane, which is valued at close to $9 million, according to ASIC documents. Also on the share register with smaller holdings are former All Black Dan Carter, celebrity chef Shane Delia, sports agents Warren Alcock and Dean Hegan of Essentially Group (which was previously headed up by Bart Campbell as CEO) and Kiwi banker Ross McEwan, who is currently CEO of Royal Bank of Scotland. A smaller shareholder still is Jon Seltin, formerly head brewer at Hawkers Beer and Bright Brewery, who has recently joined Brick Lane. Its brewery comprises a 50-hectolitre Braukon brewhouse as well as a taproom and hospitality venue, according to the job advertisement for the master brewer role filled by Seltin. 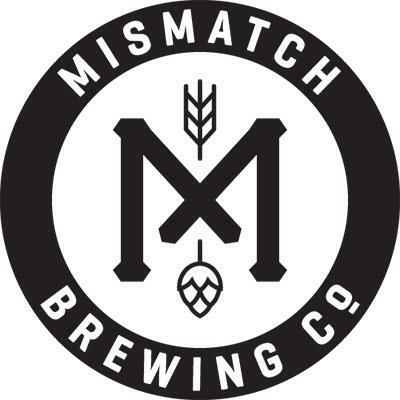 “We will initially offer 3-4 beers and the master brewer will have scope to develop a number of creative seasonal beers, supported by kegging and automated canning and bottling lines on site,” it said. Dandenong has been cited as the home of the brewery, although the exact location could not be confirmed. Through its newly appointed public relations agency, Thrive PR in Melbourne, Brick Lane Brewing Co declined to comment to Australian Brews News.